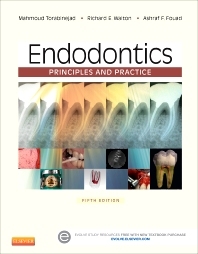 Helping you incorporate endodontics into general dentistry practice, Endodontics: Principles and Practice, 5th Edition describes how to diagnose pulpal and periapical diseases and perform basic root canal treatments. Illustrated, step-by-step guidelines make it easier to perform essential endodontic procedures, and each is brought to life with videos on the new companion website. Practical coverage also includes topics such as the etiology of disease, local anesthesia, emergency treatment, obturation, and temporization. From renowned endodontics experts Mahmoud Torabinejad, Richard Walton, and Ashraf Fouad, this edition adds new chapters on single implant restorations and the management of patients with systemic disease. Well-known, international contributors share guidelines, expertise, and their clinical experience with contemporary technologies and procedures. Fully updated, evidence-based content integrates the best clinical evidence with the practitioner’s clinical expertise and the patient’s treatment needs and preferences. Authoritative, visually detailed coverage provides a practical understanding of basic endodontic principles and procedures, including pulpal and periapical diseases and their management. Organization of content reflects the order in which procedures are performed in clinical settings, enhancing your understanding the etiology and treatment of teeth with pulpal and periapical diseases. Over 1,000 full-color illustrations ensure a clear, accurate understanding of procedures, and include radiographs and clinical photographs. Learning objectives help you meet the theoretical and procedural expectations for each chapter. 5. Diagnoses, Treatment Planning, and Systemic Considerations NEW! 6. Interaction Between Generalist and Specialists NEW! 23. Single Tooth Implant NEW!